Last month the 25th World Mining Congress was held in the capital city of Kazakhstan, Astana. Over the course of three days, June 19th to June 21st, thousands of mining professionals, engineers, scientists, CEOs and investors came from all around the world to attend the conference. Started in 1958, this global mining industry event is held every three years and has had a continual growth in country participation, from just 10 at its inception to 49 this year. On the 60-year anniversary of its establishment, the World Mining Congress shone a spotlight on the mining industry in Kazakhstan and the immense potential for future development and mineral exploration in the country. Kazakhstan is the 8th largest country in the world and one of the world’s most promising emerging markets for natural resources, ranked in the top 15 countries in the world for mineral reserves. This has made it a hotbed for Foreign Direct Investment (FDI) over the last several years, attracting record levels of FDI in 2016 worth USD 20.6billion, up 40% compared with 2015. This has resulted in substantial growth in the country’s mining industry, which is becoming an increasingly dominant part of the national economy. In 2017 the industry contributed approximately 30 per cent of export earnings, 9 per cent of national GDP and 19 per cent of industrial employment (Source: www.austrade.gov.au). The size of the reserves is huge in both terms of the amount and the variety of mineral raw materials; over 60 out of 105 elements of Mendeleev’s Table are currently being extracted in the country. Although mining in the area has been increasing, the majority of the reserves in the country remain largely undeveloped. With good reserves and a significant proportion of the deposits easily accessible, mining companies are able to use less sophisticated and therefore less costly methods for extracting the minerals. This, in addition to moderate energy and labour costs, less stringent environmental requirements and reformed mining legislation, makes Kazakhstan a great country for mining companies to invest in. Glencore, Rio Tinto, Iluka Resources and Russian Copper Company are just a few of the foreign mining companies already investing, and the Kazakhstan Government is eager to attract new investors. Kazakhstan’s geographical location makes it an important gateway between China and Europe. Another benefit that investors see is the well-established export market; around 80 per cent of mining products are exported which represents 20 per cent of the country’s total exports. Its geographical location puts it in prime position for Chinese, Indian and European markets, as well as the growing needs of the domestic economy. Situated in between China and Europe, Kazakhstan is set to play a big role in China’s Belt Road Initiative which aims to open new roads of communication and economic exchanges between three neighbouring continents, Asia, Europe and Africa. The initiative is based on the old silk road, an ancient network of trade routes that connected the East and West by both land and sea and allowed for increased trade, the movement of populations and the transmission of knowledge, ideas, cultures and beliefs. The Belt Road Initiative Map, digital image, viewed 26 June 2018, <https://www.greenprosynergy.com>. 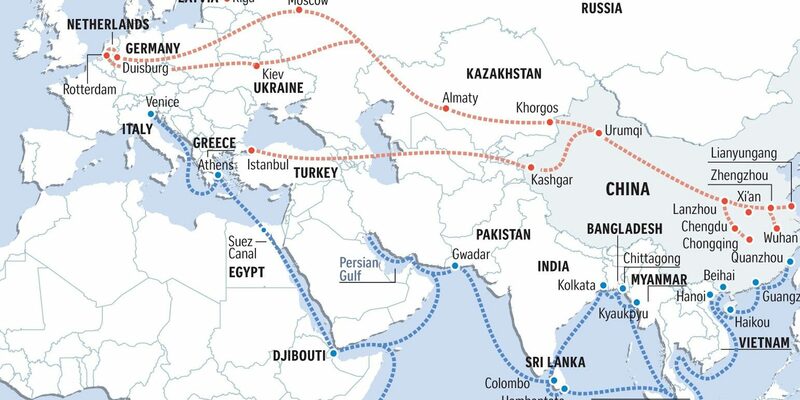 According to McKinsey management consultants, the Belt Road Initiative covers 65 per cent of the global population, a third of the world’s GDP and a quarter of all the goods and services traded between countries. With this in mind it is no wonder that China is investing hundreds of billions of dollars a year into nations that have joined the project. Playing a major role in the overland route, Kazakhstan is one country which has greatly benefited from this investment. Using a rail network to connect Asia and Europe, the overland economic belt travels through Kazakhstan on its journey and relies on the Khorgos Gateway, a ‘dry port’ rail terminal in the south of the country to process the flow of goods. Located around 15km from the border of China in the Khorgos-Eastern Gates Special Economic Zone, this transportation hub allows for the cargo to be transferred from the narrower standard gauge railway tracks that are used in China to the wider Russian gauge tracks used in Kazakhstan and other former Soviet states. What transportation options are available for cargo into Kazakhstan? With many CIS countries landlocked, transportation options can be limited. Using rail freight for heavy machinery and equipment can be a great alternative to other more common methods of transportation, especially within this region where the Russian rail provides extensive coverage and cost-effective reliable services. The railways represent a well-developed transport network of more than 86 thousand kilometres in length, spanning from Vladivostok and Nakhodka in the East to Paldiski, Riga and Klaipeda in the East. Kazakhstan’s central location means that cargo can be easily transported to the country from a number of Russian and Eastern European ports. This enables freight forwarders to combine sea and rail freight methods to deliver goods from all over the world. Freightplus preparing machinery for transport on the Russian rail network. Over-dimensional cargo and heavy machinery can also be transported overland from the south by road. Entering via the port of Bandar-e-Abbas in Iran, the goods can be transferred onto heavy haulage trucks before proceeding to their final destination. As the region’s expansion continues both in transport infrastructure and the mining sector, there will be even more movement of cargo to, from and through Kazakhstan. Freightplus has worked in the region extensively, over the last two decades, using a combination of heavy road transport partners and the Russian rail network, to transport mining machinery to multiple locations in Kazakhstan, Kyrgyzstan, Uzbekistan and Turkmenistan. Through these projects, Freightplus has developed an extensive knowledge of the region and an intimate understanding of the transport requirements within it.